Also referred to as ESFP, ESTP, ESxP, ESP, or Extroverted Sensing personality. ESP children are spontaneous, curious, enthusiastic multi-taskers with LOTS of energy. These kids—who grow up into ESFP and ESTP adults—like the unknown and like taking risks in which the payoffs are big. They thrive on adrenaline, adventure and hands-on fun and are, in general, very physical kids. ESPs don’t typically like rules or restrictions as they prefer to have the freedom to respond to situations in unconventional ways. Often popular and generally cheerful, these children seem to like and accept almost everyone. Team sports are a natural for this personality type, as is improvisational acting where kids have an opportunity to be the center of attention but also define a character on their own. Look for larger classes that will allow these kids to develop their natural talent for rapport. Scouting can also be extremely satisfying for this personality type as it lends itself toward exploration of a wide variety of subjects without being particularly restrictive from a rules perspective. The musical ESP will do well learning an instrument in a group or individually, because their outgoing natures give them the ability to play in a band with other musicians, and they have no problem performing either solos or in a group, in front of an audience. Because these kids can often be boisterous and impulsive with short attention spans, it’s best to stay away from quiet classes where the teachers thrive on order and rules. We strongly recommend auditing a class or two to make certain there’s a strong physical component of the class, or your little ESP may find himself bored. For ESP kids, just like ESTP and ESFP adults, actions speak louder than words. They learn best by example, and their teacher should model behavior. They will pick something up best if they are shown how to do it, rather than told how to do it. ESP children can try certain teachers’ last nerves as a result of their innate relentless boundary pushing. It’s very important that clear, explicit boundaries be set for them and that the instructors are consistent in enforcing the rules of the class. If this does not appear to be a teaching style of a potential instructor, it’s easy for the ESP child to be labeled a troublemaker—when, in many cases, it’s simply the personality of the instructor that does not mesh well with your child. 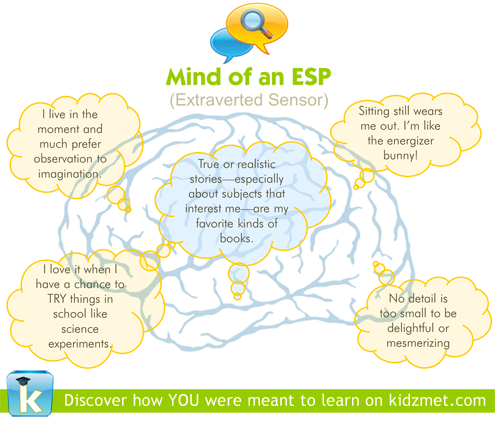 Learn even more about how your Extroverted Sensor is uniquely wired to learn as a Kidzmet member. Why Does Kidzmet Only Have 8 Personality Types? If you’re already somewhat familiar with Myers Briggs Personality Types, you may wonder why we’ve only identified eight types of personality on Kidzmet. Current research shows that children under 4 or 5 have only truly defined the extraversion vs. introversion and the perceiving vs. judging aspects of their personality type. During the early elementary (sometimes preschool) years, children begin to unveil and build strength in their dominant personality type function—one of the four remaining personality type characteristics(Inuitive, Sensing, Feeling or Thinking). It’s only in the years after about age 12 or 13 that we begin to see their auxiliary personality type become defined. Further, in a classroom learning context, not only can teaching to the more subtle nuances can get trickier, but it’s easier for learners to straddle their auxiliary and tertiary preferences throughout life. However, dominant type (the middle character in Kidzmet preferences) continues to be a child’s “hero” preference throughout their lifetime. For this reason, we’ve centered our recommendations on Jungian personality types, which form the basis of Myers-Briggs.